No one wants to see a crack in their beautiful wooden oboe but they are prone to them. While the steps listed below will help prevent cracks, it is not a guarantee as it is still possible for a crack to form. 1. Warm up your instrument in your hands or under your arm before you blow any air into it. My hands are always cold, so I have to warm up my instrument under my arm. I do this until the instrument feels warm to the touch. I want the keys as well as the wood to feel warm. This is the most important for the upper joint as this is where cracks typically happen on the oboe. 2. Once you have warmed up the outside of the oboe, you can now play some notes – low notes. This enables the air to travel all the way down the instrument. 4. Swab out your oboe after playing. It is important to remove so much moisture after playing. Be sure to take any moisture out of the tone holes and octave vents if you hear any gurgling or bubbling during playing. 5. To oil or not to oil? That may indeed be the question. This topic is highly debated in the oboe world and it is a matter of personal preference and experience. Before deciding whether to oil your wooden oboe: do plenty of research by speaking with qualified repair techs, research reasons why other professional oboists oil or not oil and speak with your oboe instructor as well. Don’t warm up your instrument by blowing hot, moist air into the top joint. Warm up the oboe under your arm or in your hands first! Don’t leave your oboe in the car during the winter (or summer for that matter!). 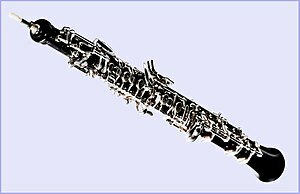 I treat my oboe like my baby – I wouldn’t leave my baby in a cold car or hot car for even a few minutes so I won’t do that with my oboe. Hopefully you will be fortunate enough to never experience cracking in your oboe. Happy practicing! This entry was posted in Education, Oboe Care and Maintenance and tagged Humidity, oboe. Bookmark the permalink.